Members of German Metal Workers' Union IG Metall protest in front of a Bosch factory in Berlin. FRANKFURT -- Volkswagen Group and Ford Motor were among companies hit by a second day of 24-hour strikes by industrial workers in Germany over pay and working hours on Thursday. The IG Metall union has called for full-day walkouts through Friday, firing a last warning shot before it ballots for extended industrial action that could be crippling to companies reliant on a supply chain of car parts and other components. About 68,000 workers at 80 companies including truckmaker MAN and automotive supplier ZF Friedrichshafen put down their tools on Wednesday, IG Metall said. By Friday, that number is expected to rise to about 260 companies, including Daimler and Porsche. Daimler CEO Dieter Zetsche said on Thursday it would be hard to make up for production shortfalls caused by strikes. "We are impacted from north to south Germany by strikes, the legitimacy of which is still being discussed. We are already producing at the limits of our production capacity, so catching up is difficult," Zetsche said, saying he was interested in a deal being reached with IG Metall. Workers at VW’s headquarters in Wolfsburg and at sites in western Germany are staging separate strikes on Thursday after IG Metall rejected an improved pay offer for about 120,000 staff at the automaker. 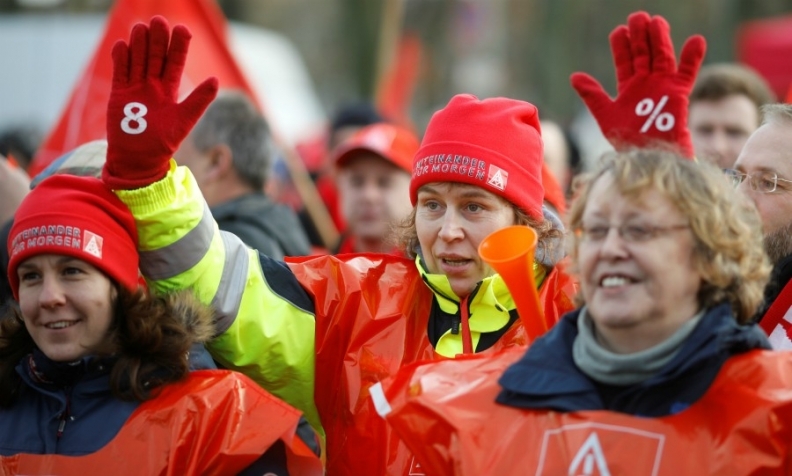 Emboldened by the fastest economic growth in six years and record low unemployment, IG Metall is demanding an 8 percent pay rise over 27 months for 3.9 million metal and engineering workers across Europe's largest economy. The union has also asked for workers to be given the right to reduce their weekly hours to 28 from 35 to care for children, elderly or sick relatives, and to be able to return to full-time work after two years. This is IG Metall's first major push for a change in hours since workers staged seven weeks of strikes in 1984 to help secure a cut of the working week to 35 from 40 hours. Employers have offered a 6.8 percent wage increase, but rejected the demand for shorter hours unless they can also increase workers' hours when necessary. They have also dismissed the idea that they should make up some of the pay shortfall for workers who cut their hours, saying that would mean some being paid a higher hourly wage than others. The DIW economic institute has estimated the strikes could cost companies a total of 62 million euros ($77 million) a day in lost revenue, assuming about 50,000 workers, or on average 200 per company, stop working for one day each. Both the union and employers have left the door open to resuming talks after the planned strikes end on Friday, but each is demanding more willingness from the other to make concessions. "There can only be an agreement if the employers improve their stance on all three topics: pay, the right to shorter hours and aid for workers burdened by their situation at home or at work," IG Metall chief Joerg Hofmann said. The employers are also challenging the strikes in court and seeking damages.